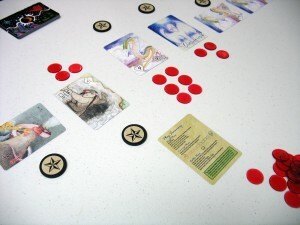 Dragon Line is a real world, playable version of a fictional card game played by the characters in the Isles of the Sun setting. It is available for purchase at The Game Crafter in a box or as ‘print and play’ files. There is also a ‘Deluxe Edition’ of the game which comes with higher quality tokens and a sturdy boardgame-style box. In the canon of The Isles, the game is produced by a small trading company in Lioport called Brian’s News. Originally devised as a sort-of marketing tool by the company’s eccentric owner, Brian Niagra, the game was released in several editions, each with some varying cards. The original rules are mostly lost, and very few sets are complete. Instead the players trade for or purchase individual cards that they want for their personal deck. 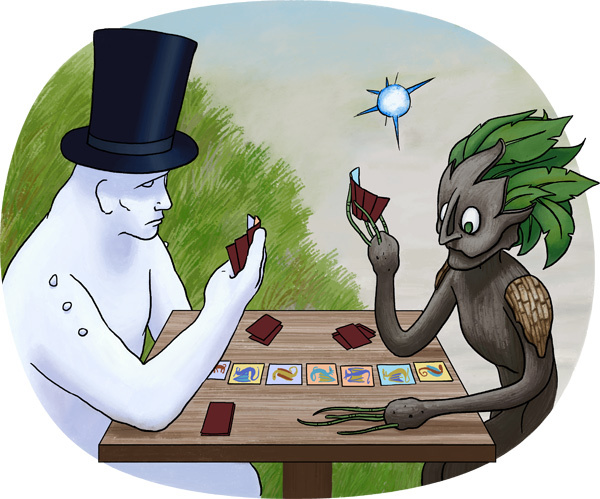 Each card is illustrated with a dragon from Isles mythology, and has its own combat statistics. In this non-fictional edition, each player builds a small army of dragons with which to face their opponent, chooses in which order the dragons approach the enemy lines, and attempts to be the player with dragons remaining in hand at the end. With clever drafting rules and thirty-five unique dragon cards, every hand of Dragon Line is a different game. In the ‘build’ phase, the players build their dragon army by taking turns looking through the split deck and drafting dragons into their hand until they each have six dragons. In the ‘line-up’ phase the players choose their starting line of four dragons, which will face off against their opponent in the first round of the ‘battle’ phase. In the ‘battle’ phase, the players secretly plan attack strategies, calculate the dragons’ attacks, remove destroyed dragons, and replace them with dragons from their hand in a series of rounds. The winner is the player who doesn’t run out of dragons in their hand first. There are no dice in combat, so all of the battling is math and tactics. The dragons’ abilities are straightforward and balanced, but the way those abilities can interact with one another can become more complex, and create interesting situations.